Because of its healing properties, peyote has long been recognized by Native Americans as a medicinal plant. Traditionally peyote was often used as analgesic, treating things including toothaches, rheumatism, asthma, and even cold symptoms. Some tribes, such as The Tarahumara, commonly used masticated peyote as a topical treatment to bites, burns, wounds, and aching muscles. Even today, it has been used to treat a wide range of medical problems. In some cases, Lophophora willamsii has been prescribed by mental health professionals as a treatment of neurasthenia. It works well to improve the symptoms of anxiety, headache, fatigue, and depressed mood associated with this condition. Various alkaloids are present in Lophophora williamsi. These give this plant it’s medicinal attributions. A few examples of these different alkaloids include: anhalonine, pellotine, lophophorine, and anhalamine. However, the most abundant is mescaline, which give the user the greatest effects. 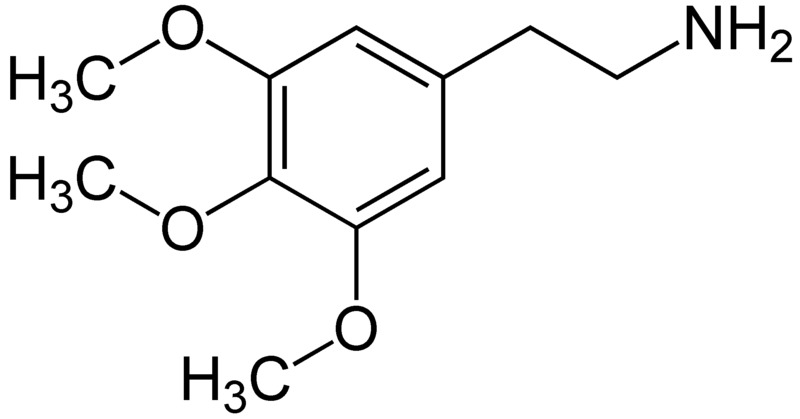 Below is a diagram of the chemical structure of mescaline. Peyote also contains peyocactin, which conveniently has antiseptic and antibiotic features. Surprisingly, it successfully stops the growth of certain strains of bacteria that are resistant to penicillin. As far as the antiseptic side, when open wounds are treated with the plant, a very strong scab forms which closes up the wound. Many Native Americans swear by it and often described the healing as being "better than stitches". How is peyote consumed, and what is the normal dosage? 350 mg of mescaline is the normal dosage although clear effects can be felt from as little as 100 mg. On average a dried button is around the size quarter and weighs only about 2 grams. For that reason, it usually takes 6-10 of these buttons to achieve the desired effect. There are a few methods to take in L.williamsii . Traditionally, the easiest way is to simply eat the fresh or dried buttons. Many people find the taste to be extremely unpleasant and bitter. Because this is too much to handle for some, other methods have been adopted. The dried buttons can be grinded up, put into capsules, and taken in pill form. While this method is still effective, it can take up to 20 capsules to get the appropriate dosage. Other times, the peyote is prepared in a concentrated tea. Again, it will have a bitter taste, but many find it easier to drink a cup of tea in a few gulps rather than eating 10 buttons. Because peyote is harsh on the digestive system it is suggested that one should not eat more than six hours prior to consuming it. What are the risks of taking peyote? The toxicity of Lophophora williamsii is low. There have not been any reported deaths caused by this drug. One positive thing is that the effects wear off in 10-12 hours, so there is rarely any intervention by medical professionals or lasting effects. However, because everybody’s body reacts differently to this substance, some people experience unpleasant reactions. By taking a look at the chart below, you can see there is an extremely wide range of side effects associated with the consumption of peyote. Changes in perception of what is "reality"
It is clear that Lophophora williamsii is a very universal treatment for many common ailments, and many Native Americans resort to it like we would Aspirin or Tylenol. That being said, there are always people who abuse it, using it solely for recreational purposes. To learn more about this topic, visit the legal section on the next page. Otherwise visit the homepage and explore on your own.